The modern diesel internal combustion engine burns only approximately 70% it's of diesel fuel in the combustion process. The other 30% turns into unburned hydrocarbons that clog up the DPF and EGRs while the remainder contaminates the oil, and blows out the stack producing pollution and smog. Hydrogen burns 10 times faster than diesel and expands by 20,000 times its volume. When introduced via a delivery line on the vacuum side of the turbocharger, the hydrogen excites the diesel molecules, increasing the speed of the burn and therefore burning almost all of the diesel fuel. The large quantity of unburned fuel left after regular combustion results in particulate matter (soot) which is one of the major air pollutants, and a large contributor to clogging engine parts. The D-HAT™System from HoD Pros uses electrolysis to split distilled water into hydrogen and oxygen gases. These gases are infused into the air intake of a diesel engine. Since hydrogen burns so much faster than diesel fuel it causes the diesel to burn more completely thereby using up almost all of the fuel. Less fuel left over after the burn equals fewer pollutants, better mileage and cleaner running engines. Hydrogen burns significantly faster than diesel fuel, and with a significantly lower Flammability Limit (LFL, or sometimes LEL). These factors lead to small amounts of hydrogen having significant positive effects on diesel fuel combustion. The first and most important effect, for our purposes, is that the hydrogen promotes a faster and more complete burn of the diesel fuel, closer to the top of the power stroke in a diesel engine. This leads to increased thermal efficiency, which necessarily leads to less fuel spent for a given amount of work. 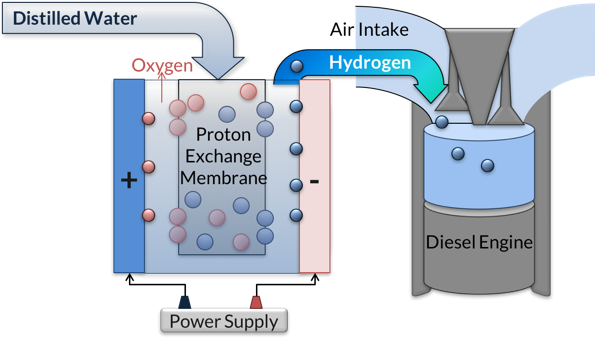 In addition, hydrogen has a significant stabilizing effect on cycle-to-cycle variations in combustion, which leads to further efficiency improvements. The addition of hydrogen to the combustion cycle also has significant effects reducing unburned hydrocarbons(cardon deposits), both due to the properties of hydrogen in combustion itself and the increased thermal efficiency resulting from the hydrogen-enhanced combustion. A faster and more complete burn leads to dramatic reductions in unburned hydrocarbons (Particulate Matter), and in carbon monoxide (CO). The increased fuel economy leads to a reduction in carbon dioxide levels (CO2), and the higher thermal efficiency of the combustion cycle leads to lower exhaust temperatures, which leads to a reduction in nitrous oxides (NOx).